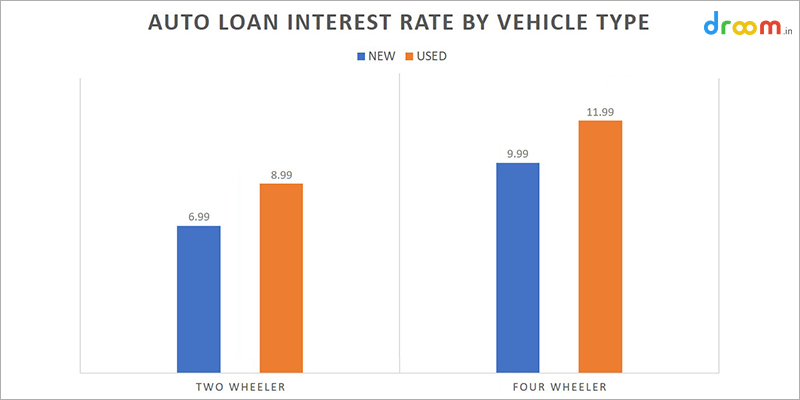 The car loan interest rate in India 2019 starts from 6.99%. This is the starting percentage of interest rate of car loan of any Indian bank or NBFC. But, the rate of interest keeps on changing from one lender to another. It also varies on the basis of type of vehicle you choose, credit score, tenure of the loan, age of the financed car, and customer’s riskiness profile. Lender’s feel scared to offer a loan to a customer whose profile is risky. That is one of the main reasons why the rate of interest keeps on increasing. 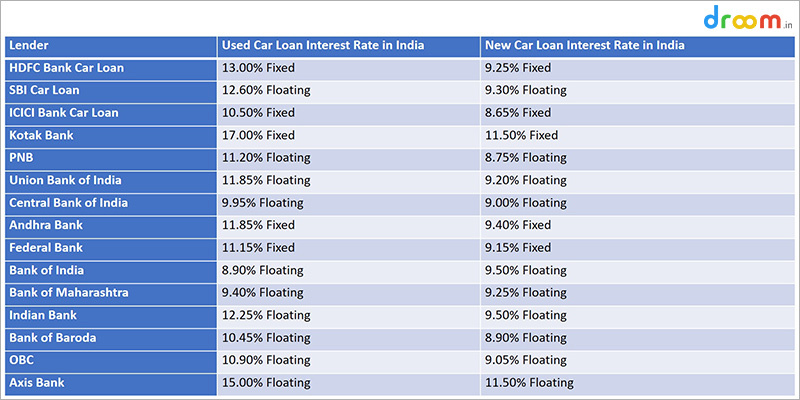 So, the auto loan interest rate in India may range from 6.99% to 15% or even more. You can be a two-wheeler or a four-wheeler person, but as per your choice of vehicle, the auto loan type will differ. If you choose to purchase a two-wheeler, that can be a bike or a scooter, the rate of interest will be much lower as compared to car. The rate of interest of a new two-wheeler will start from 6.99%. But there is one more factor when it comes to vehicle type; you may choose a new or a used vehicle. The interest rate of a used bike or scooter will range from 8.99%. This is also applicable in case of a car loan. If you think of purchasing a new car, the rate of interest may start ranging from 9.99%. But the used car loan interest rate in 2019 will start from 11.99%. You may be wondering why the rate of interest of used vehicles is much higher than the new ones. This is because, in the case of used vehicles, the risk involved with the lender is higher, so they charge a higher interest rate. The other types of vehicles are commercial vehicles and electric vehicles. Mostly used four wheelers are purchased as commercial vehicles and its rate of interest starts from 14.99%. And, mainly new two-wheelers are used as electronic vehicles, which can be purchased on car loan at 9.99% interest rate. Credit score is one of the main factors that acts as a driving factor to determine the interest rate. A credit score between 750 to 900 is considered as a good score and lenders can fully trust on such applicants. They believe a borrower with 750+ credit score will not be a defaulter. So, the rate of interest offers to this section of people usually starts from 11.99% in case of used car loans in 2019. 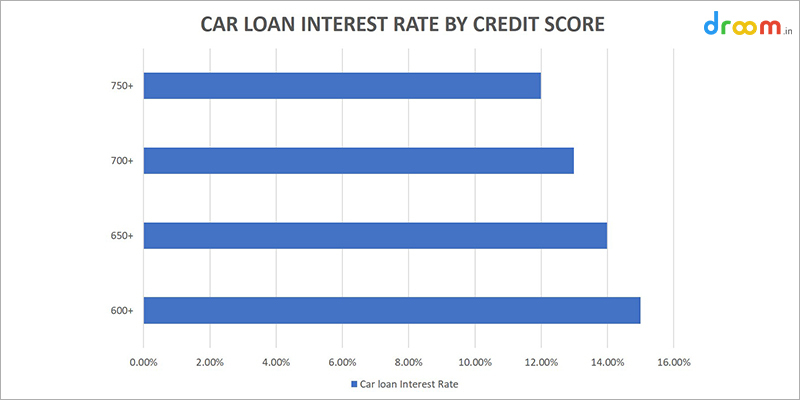 If the credit score keeps decreasing, the rate of interest of a car loan keeps increasing. So, the interest rate and the credit score are inversely proportionate. If an applicant has credit score 700+, the rate of interest of used car loan will be around 12.99%, that is 1% more than the previous group with higher credit score. This is also applicable to other sections as well. If the credit score is 650+, the rate of interest will go high by 1% more, that will count to 13.99%. This further step will go similarly. If the credit score goes down to 600, then the interest rate will increase up to 14.99% and so on. 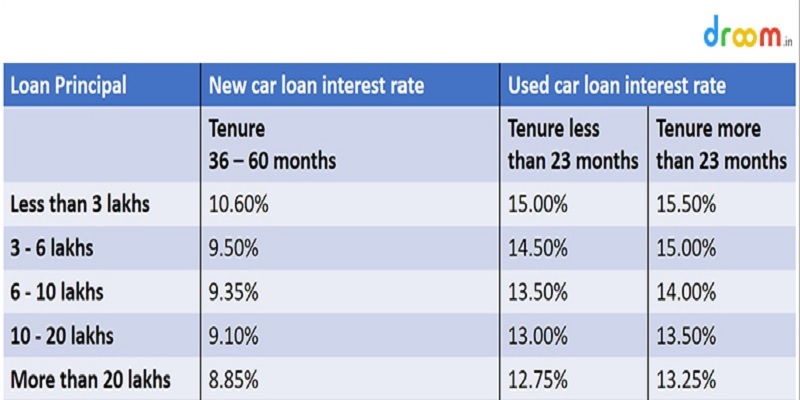 Loan principal and tenure are two more factors that determine the interest rate of a car loan in India. It has been seen that the higher the loan amount, you will have to pay less interest rate to the lender. And, if you avail for a lower tenure, the interest rate will be lower. If you apply for a used car loan in 2019, less than 3 lakhs and the tenure is less than 23 months, then the interest rate will be 15.00%, whereas when it is more than 23 months, the rate will be 15.50%. Similarly, when the used car loan that is 3 to 6 lakhs and the tenure is less than 23 months, the interest rate will be 14.50%, whereas when it is more than 23 months, the rate will be 15.00%. The similar phenomenon happens if you apply for 6 to 10 lakhs and the tenure is less than 23 months, the rate will be 13.50%, and when the tenure is more than 23 months, the rate will be 14.00%. There is no exception when you apply for a loan of 10 to 20 lakhs, the interest rate is 13.00% for less than 23 months and 13.50% for more than 23 months. And the same for more than 20 lakhs, where the interest is 12.75% for less than 23 months and 13.25% for more tenure. When it comes to new car loan, and the loan tenure is fixed between 36 to 60 months, the rate of interest keeps decreasing with the increase of loan amount. If you apply for a new car loan in 2019 less than 3 lakhs, the rate of interest will be around 10.60%. If the loan principal lies between 3 to 6 lakhs, the rate of interest will be 9.50% and once the loan is 6 to 10 lakhs, the interest is 9.35%. Similarly, once the loan principal increased to 10 to 20 lakhs, the rate will be 9.10%. And, once it crosse the limit of 20 lakhs, the interest rate of a new car loan will be 8.85%. The rate of interest even varies greatly from one lender to another. Though there are some set rules and percentage by RBI, banks demand the interest as per their choice and benefits. But their rates remain within a limit maintaining the RBI regulations, so a slight difference can be noticed among various lenders. Standing in 2019 while availing cheap car loans, you need to compare all these lenders and choose the best one. However, as mentioned earlier, the rate of interest of a new car loan is much lower as compared to a used car loan. The purchase of used car can be a little risky for the lender, so they charge a higher rate of interest. Henceforth, the above-mentioned factors play vital roles while deciding the interest of a car loan. So, each case will be different, and each individual will experience a different loan interest and benefit. Hence, before applying for a car loan you should research, verify and gather information properly to avoid any fraud or expensive deal.